Jolted by the crushing defeat in the second one-dayer against South Africa, Indian captain Rahul Dravid sought to convey a strong message to his struggling batsmen, saying that they will have to find a solution to survive on bouncy tracks. India’s embarrassing capitulation to the South African pace attack does bring into question if the one-day series is going to be totally one-sided. Yes, the Indians are slow starters and do pick up after a few games, but it may well be too late by then, at least as far as the one-day series is concerned. Will Dhoni do a Sehwag? The opening day of England’s Ashes defence started badly and got worse for the tourists, with Ricky Ponting’s 32nd Test hundred lifting Australia to 346 for three by stumps. Pace spearhead Steve Harmison’s attempted bouncer, the first delivery of the series-opening match today, skewed off the pitch to England skipper Andrew Flintoff at second slip. 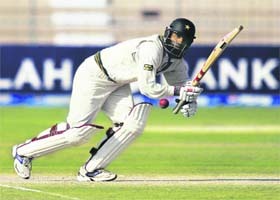 Prolific batsman Mohammad Yousuf smashed a record-equalling century today as Pakistan forced a draw in the second cricket Test against a resurgent West Indies. Indian eves blazed a golden trail, lifting four gold, one silver and three bronze medals to sweep the overall championship in the fourth World Women’s Boxing Championship, which concluded at the Talkatora indoor stadium here today. Punjabi University continued to dominate proceedings by annexing two more gold medals on the second day of the All-India inter-university cycling championship being held at the university velodrome here today. Top seeded India took an unassailable 2-0 lead over China, with Rohan Bopanna following up team-mate Sania Mirza’s easy victory by winning the second singles against Mao Xin Gong in the first round of first Asia Hopman Cup tennis championship at the SAAP complex here today. The 26 year-old Davis Cupper, Bopanna crushed his lowly ranked Chinese opponent Gong in straight sets 6-3, 6-2. Young midfielder Ajmer Singh and striker Adam Sinclair have made a comeback to the 16-member Indian hockey team for the Doha Asian Games scheduled to start next month. Hosts Punjab stormed into the final of the 43rd Junior National Football Championship (North Zone) edging out Uttaranchal 2-1 in the first semifinal at Malerkotla’s Zakir Hussain Stadium today. Exploiting the early conditions to the hilt, Punjab pacer Gagandeep Singh ran through the Bengal top order to trigger a collapse which saw their innings end at 156 in 53.1 overs on the first day of Elite Ranji match at Punjab Cricket Association Stadium here today. After battling wind and rain on the first two days, the golfers putted under perfect conditions on the course of the Chandigarh Golf Club here today. Jeev Milkha Singh continued his quest for a maiden title in Japan as he gained shared lead on the opening day of the $1.19 million Casio World Open golf tournament here. A last minute strike by Surajit Bose ensured Mohun Bagan a 1-0 victory over spirited Air-India and a semifinal berth in the 119th Osian’s Durand Cup football tournament here today. Dravid asked his team-mates not to get disheartened by this defeat and take it up as a challenge for the rest of the series. “It does not help to get disheartened. One has to come up with solutions both as a team and individually. This is the bowling we would face right through the summer. We need to try to find answers otherwise it’s going to be tough,” Dravid said yesterday after India’s 157-run loss against South Africa. Dravid played down the fact that how much the team relies on Sachin Tendulkar and himself under such conditions but said that the younger batsman need to apply themselves when the team wants them. “It is not surprising that the team depends on key players. All the sides rely on their key men. South Africa for instance relies a great deal on Jacques Kallis and we saw it today how much he means to them,” he said. 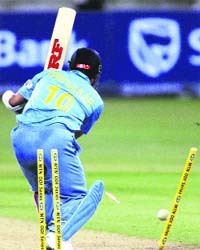 When being asked about team’s experimentation, Dravid said, “I do not think we are experimenting; we are trying to win. If somebody is unfit and injured and cannot play then we can’t do anything about it,” he said. Dravid said for long it has been felt that pitches in domestic tournaments should be made lively if India aspires to play consistently well abroad but that has not happened. “We have said it before that if we want to be competitive consistently abroad in such conditions, we have to prepare such wickets from junior to Ranji Trophy levels. It’s not something that I am saying new, a lot has been said and written on it. But how it can happen and whether it can happen is to be seen,” he said. South African skipper Graeme Smith said they intend to better their performance in the coming matches. “Our bowling was alright but I thought our batting is still rusty. We could have done with a total of 270 on this wicket. But we intend to get better in the coming games. Smith also made a point that Indians were perhaps a bowler short in the game, a fact that also met the nod from man of the match Jacques Kallis. “Indians looked to be a bowler short but overall they bowled very well. It was not a free-scoring wicket so I am pleased with my knock,” On Andre Nel’s explosive spell of four for 13, Smith said the right arm pacer deserved all the praise. “He had an opportunity today. Normally Shaun Pollock and Makhaya Ntini walk away with the glory but today it was his turn,” he said. More than the defeat, it was the complete lack of resistance that was disappointing, and apart from Tendulkar and Dravid, all other batsmen looked completely out of their depth. The Indians have gone on record that they should have had more preparation for this tour, and so should have had a few more warm-up games. But why was it not done? Is there a lack of communication between the team, management and the officials of the BCCI? There’s no doubt that the BCCI has gone out of its way to concede to almost every wish of the team coach, and perhaps the officials were never asked if the team could go early as well and have a few extra practice games. There was no camp before the team left, which is what happened when the team left for the West Indies, and where too, they lost the one-day series. While camps by themselves are not the answer since the pitches will be totally different than the ones at home, it’s the fact that the players start thinking about the game than other things that can help at these camps. They don’t have to be physical conditioning camps, because in the middle of the season, you need less of that than practicing and honing cricketing skills, but surely the team getting together barely hours before they leave for an important overseas tour is not the ideal way to prepare for the tour. There was a silver lining of sorts in the return to form of Zaheer Khan, who was making a comeback to the Indian team and even when he was brought back for another spell, he was quickly into his stride and not stiff as he was prone to be in the past. He has certainly worked hard on his fitness and while it may be too late to add the incoming ball to his repertoire, he will be a more lethal bowler if he even manages to straighten it more often as he did to get Bosman out LBW. The opening day of England’s Ashes defence started badly and got worse for the tourists, with Ricky Ponting’s 32nd Test hundred lifting Australia to 346 for three by stumps. Pace spearhead Steve Harmison’s attempted bouncer, the first delivery of the series-opening match today, skewed off the pitch to England skipper Andrew Flintoff at second slip. Australian opener Justin Langer took two boundaries off Harmison in that over and the lanky English quick was taken out of the attack after conceding 17 runs in his first two overs. Langer scored 82 and Mike Hussey contributed 63 to an unbroken 148-run fourth wicket stand with Ponting. 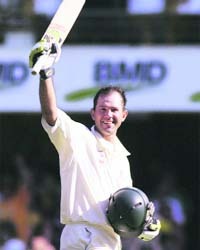 Australia captain Ponting played a commanding innings, hitting 17 boundaries from 206 balls. He now shares the Australian record with Steve Waugh for Test centuries and is equal fourth on the all-time international list behind India’s Sachin Tendulkar, who has 35. It was Ponting’s fourth hundred in five innings in Australia and ninth in 13 Tests since losing the Ashes series 2-1 last September in England. The pace attack that propelled England to that upset series win took a battering in front of a ground-record 39,288 people under cloudless spring skies at the Gabba, which gave some extra bounce but no hint of serious swing. Flintoff, who has restricted his bowling since returning from ankle surgery following the last England summer, had to shoulder the load of the fast bowling and netted 2-48 in 16 overs. Fall of wickets: 1-79, 2-141, 3-198. Yousuf (191) missed the opportunity to score a double century on the final day when the match was called off with Pakistan progressing in its second innings at 461-7 for an overall lead of 227 runs. Yousuf survived a couple of close lbw appeals and was dropped on 108 before settling down in the afternoon sessions and hit 21 boundaries in his 344-ball knock, spanning just over seven hours. Fall of wickets: 1-24, 2-124, 3-243, 4-284, 5-306, 6-458, 7-461. MC Mary Kom expectedly defended her 46kg gold, when she made mincemeat of Steluta Duta of Romania with a 22-7 points haul, but what surprised the Indian team management was the authoritative manner in which Jenny R L (63kg), Lekha K C (75kg) and Sarita Devi (52kg) swept the golds. Only Nagisetti Usha could not live up to expectation, and lost her 57kg final to settle for the silver. The semifinal defeats of Aruna Mishra (75kg), Chhotu Loura (50kg) and Renu (80kg) yesterday bolstered India’s medals tally as they were awarded bronze medals. As per the latest rule, the semifinal losers are given bronze medals without going through the rigmarole of fighting for the bronze again. MC Mary Kom created a world record by winning her fourth gold, which stirred up a virtual hysteria in the packed hall. Silver medallist in the inaugural World Championship in the USA in 2001, Mary Com hit the gold in the second edition at Turkey in 2002, and retained her title at Norway in 2004 and Moscow in 2005. 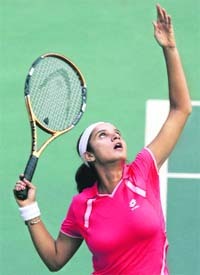 She also won the Asian Championship gold in 2003 and 2005. What stood out in Mary Kom’s fight against the former world No 2 in the 48kg Steluta Duta of Romania was her relentless aggression and virtually flawless defence, which helped her earn points at will. Mary Kom led 9-4 and 15-5 in the first two rounds before making a final assault to take her lead to a staggering 22-7 to wrap up the gold. Before Mary Kom kept her date with the gold, 23-year-old police inspector from Mizoram, Jenny R Lalremliani, had won the second ever World Championship gold for India when she stopped Klaras Svensson of Sweden in the second round of the 63kg title bout. After yesterday’s gold medal winning effort by Abhishek Rana in the 1-km time trial event, the hosts once again put up an impressive show by winning the gold in the 1500m team time trial event and the Olympic team sprint, with the hero of both races being Abhishek Rana. In the 1500 m team trial event, the Punjabi University quartet of Abhishek Rana, Manish Sahni, Sarpreet Singh and Gursharandeep Singh displayed good tactical acumen to win the gold by clocking 1.49:79 seconds. The hosts riders were followed by foursome of Panjab University, Chandigarh, of Amandeep Singh, Jagdeep Singh, Jovenjot Singh and Simranjit Singh who clocked 1.52:92 seconds to finish second. Bikaner University team, comprising Shishpal Jatt, Dyala Ram Jatt, Ramesh Narayan and Amit Ranga clocked a timing of 1.53:49 seconds to bring up the rear. Top seeded India took an unassailable 2-0 lead over China, with Rohan Bopanna following up team-mate Sania Mirza’s easy victory by winning the second singles against Mao Xin Gong in the first round of first Asia Hopman Cup tennis championship at the SAAP complex here today. The 26 year-old Davis Cupper, Bopanna crushed his lowly ranked Chinese opponent Gong in straight sets 6-3, 6-2. Ranked 259 in the world, Bopanna broke his opponent’s serve in the fourth game of the first set and the third and the fifth games in the second set to clinch the match. Defender Harpal Singh’s inclusion in place of Kanwalpreet Singh is the third change in the squad, which had a lacklustre showing at the World Cup in Germany in September. India, placed in Pool B, will meet Bangladesh in their opening match on December 4. They will take on China (December 5), Oman (December 8) and Korea (December 10) in subsequent league matches. Having gone into arrears midway into the first half when Shailender Singh of Uttaranchal found the net with a superb header in the 19th minute, Punjab rallied to subdue the visitors, who though beaten, were certainly not disgraced. The initial setback did not demoralise Punjab, who reorganised themselves and restored parity in the 27th minute. A free kick was capitalised by striker Dalbir Singh whose header gave the rival goalie absolutely no chance (1-1). The hosts had to wait till the 85th minute for the match winner. A cross from the flanks was brilliantly headed home by Jagdish Singh sending a wave of joy in the Punjab camp (2-1). In the final to be played on November 26, Punjab will meet the winners of the UP-J&K semifinal to be played tomorrow. Earlier, Sourav Ganguly, who is looking for a big innings to have a chance of making it back to the national team, disappointed with the bat scoring just six runs. However, he managed to claim two wickets in Punjab’s first innings. Brief scores: Bengal (1st innings): 156 all out in 53.1 overs (Deep Das Gupta 78, L. R. Shukla 30; Gagandeep Singh 4 for 36, Loveabhilish 2 for 39). Punjab (1st innings): 75 for 3 in 29 overs (Ravneet Ricky 33 n.o., Manish 31; Ganguly 2 for 12). After battling wind and rain on the first two days, the golfers putted under perfect conditions on the course of the Chandigarh Golf Club here today. And at the end of the penultimate round of the Royal Challenge Samarvir Sahi Amateur Golf Championship, Anirban Lahiri and Gaganjeet Bhullar returned identical three under cards of 69. But the Bangalore boy led the leaderboard because of his overnight four-stroke lead. Lahiri’s tournament tally now stands at six-under 210, with Bhullar occupying second spot at two-under 214. Scores (after 54 holes): Anirban Lahiri 71+70+69=210; Gaganjeet Bhullar 70+75+69=214; Simarjeet Singh 71+75+71=217; Jasjeet Singh 72+73+74=219; Joseph Chakola 78+72+70=220; Saurabh Bahuguna 78+72+78=220; H.S. Kang 79+75+71=225; Balpreet Singh Ghuman 72+74+79=225; Tarun Goghale 78+76+72=226; Karan Vasudeva 78+74+74=226; Pawan Kumar 77+78+72=227; Raj Randhawa 77+76+74=227; Moin Malak 74+79+77=228. Jeev shot a flawless six-under 66 to share the lead with two other Japanese players, Azumo Yano and Tetsuya Haraguchi, at the Kuroshio Country Club. The trio was one shot clear of Hideki Kase, who shot a five-under 67. In a Group I quarterfinal match, Surajit connected a cross from the right by Dulal Biswas in the 90th minute to help the 16-time champions come out unscathed and collect full points.